I've begun to try to read my way through a list I'm in the process of compiling of what might be the hundred best novels of the 1910s. I say might be because I've read hardly any of them; I'm going on reputation and (as far as I'm able to given my limited linguistic abilities) trying to be as varied as possible. So it, like everything I do, is a work in progress. 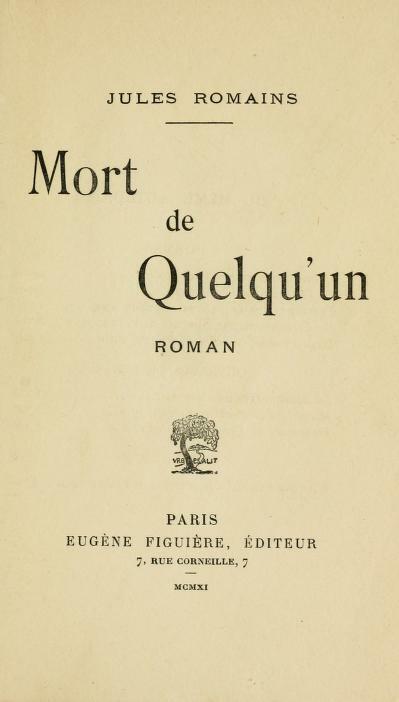 I'm reading several at once in a bunch of different formats, and the first one I happened to finish is Jules Romains' debut novel, Mort de quelqu'un, which I understand could just as easily have been translated "death of anybody." The childless, widowed retired engineer Jacques Godard who dies shortly after climbing to the top of the Panthéon to look at Paris for the first time is both nobody and anybody, and Romains takes his death, funeral, and brief afterlife in the memories of those who knew him as the occasion for a lyrical, philosophical, and even slightly mystical novel, working out his eccentric theory of "unanimism," the idea that the collective spirit of any group, however arbitrary or transitory, supersedes that of its individual members. You don't have to subscribe to unanimism to enjoy Romains' keen psychological and poetic insights, but given the sorry state in which the Western credo of materialistic individualism has left the world, I'm all for the creative reimagining of collective life. Death of a Nobody is a beautifully-written, occasionally-amusing, and surprisingly wise little novel, extremely French but all the more universal for that. Another Romains book is a candidate for my list, and I'm looking forward to reading it too.